Many of us know what it’s like to work from home. Distraction upon distraction tends to stunt our productiveness. If only more of us could convince our employers that we can, in fact, stay motivated and actually get work accomplished in the confines of our own home offices. The design team at Synthesis recently installed Chelsea Workspace that is a custom home office for a private personal investment advisor. 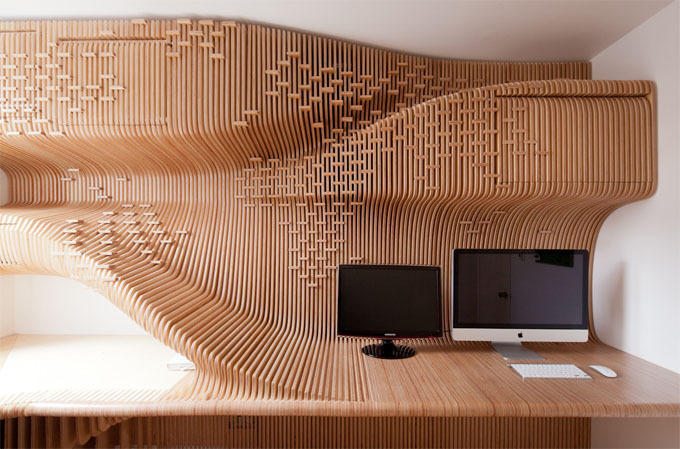 Constrained by both budget and space, the design team at Synthesis enwrapped a series of prefabricated CNC milled birch plywood ribs atop all the necessary features any home workspace should include: a desk, sliding and hinged storage units, a printer and paper shredder, concealed paths for wires and cables and recesses for lighting – thereby eliminating all unnecessary clutter. One small window emits natural light onto the surfaces where horizontal spacers are arranged in the pattern of a world map, which will allow the owner to map out his travels. 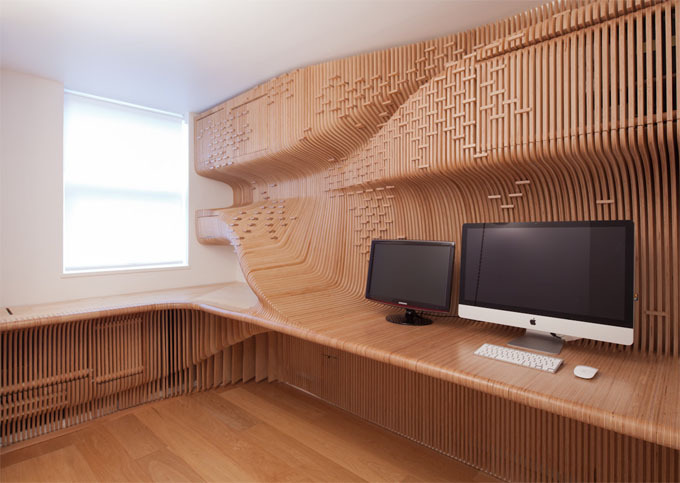 The design of the work space presents a viable solution to ensure working from home can be free from distraction, and where focus in an innovative space ensures the highest level of productivity.